During my no-spend challenge in January, I didn’t join a single Swap-Bot swap. Come February and I was getting withdrawal symptoms, so I decided to join a UK only ATC swap, to keep the cost down. The theme of the swap was ‘Hearts’. I think I may have gone a little overboard with the theme as I can count over 25 hearts visible on this tiny ATC! 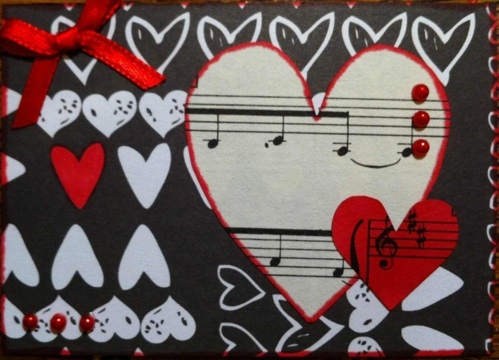 I used some old sheet music and cut out a couple of heart shapes, colouring one in with a red ProMarker. I also coloured in one heart on some black and white heart backing paper (I do love the black white & red colour scheme!). Some red adhesive pearls and a ribbon bow completed the look. As I mentioned in my Back in the Craft Room post in January, my mother-in-law gave me some awesome sight test and spectacle themed stamps for Christmas. So far I haven’t used them nearly enough! So I thought I’d have a go at making an ATC. I stamped the spec frame onto vellum and cut it out, so the vellum looks like lenses. I used a blue marker pen to add some eyes behind the lenses (there was a bit of a disaster when the glue I used to fix the specs onto the ATC smeared the eyeball all over the back of the lens, but I just about managed to resurrect it, although you can still see the smudge ). 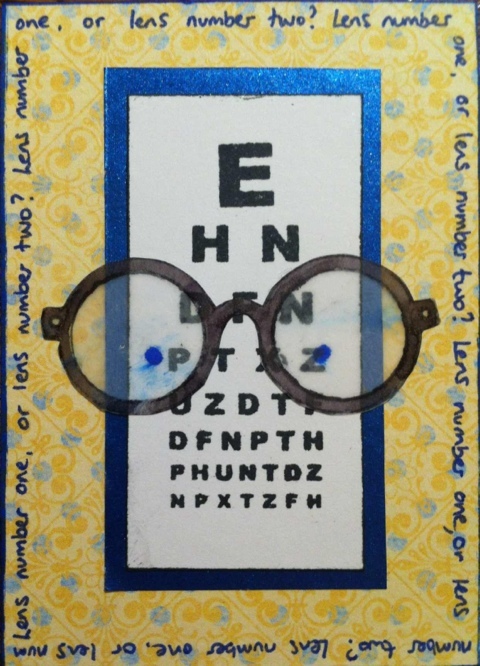 I stamped an eye test chart onto white card, then mounted it onto blue paper, then onto the backing card. I edged the whole ATC with a blue marker pen to match, then wrote ‘Lens number one, or lens number two?’ all around the edge of the ATC to create a border. I’m really pleased with how it’s come out! This entry was posted in ATCs and tagged ATC, ribbon, rubber stamping, vellum. Bookmark the permalink.